Our Preferred Lender funds virtually any type of case in which you have been injured due to another insured party’s negligence, have provable injuries and have hired an attorney. The majority of states do not consider this a Loan. Often it is referred to as litigation financing or litigation funding, but it is actually an advance on the future value of your case. Unlike a loan, if you lose your case you owe nothing in return! 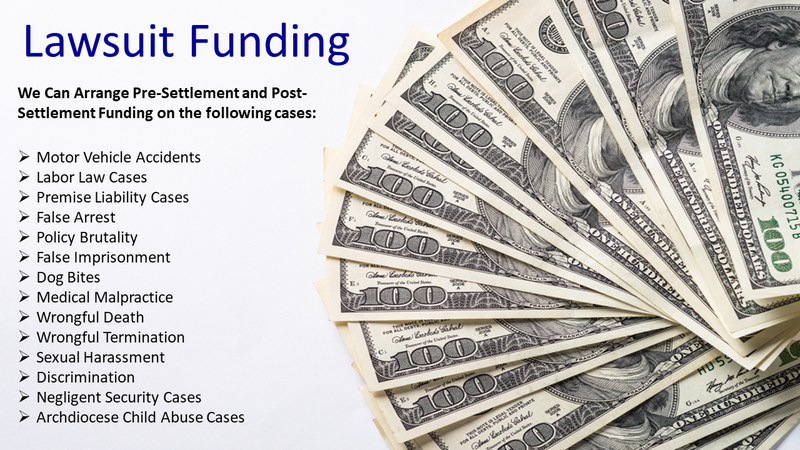 Legal funding is a way to focus on your case without having to cope with the financial burden or waiting for the case to settle to receive your settlement. Our Lending Partner does not just give you money, instead, they invest it in the future of your lawsuit. Even though our lending partner offers you some of the lowest rates in the industry, lawsuit funding is expensive when compared with many other forms of financing. Accordingly, we highly recommend that you first try less expensive resources such as banks, credit cards or family and friends before trying our service. Think of our service as last resort legal funding. If you have a case and have hired an attorney you can be considered. To find out, simply fill out the application below! We will consider almost any type of case. We can secure your funding against your workers compensation case in most states. Please note that we can get you funding for workers compensation third party cases in all but a few states. A third party case is a case in which you are suing another party in addition to your employer or your employer’s insurance. Our Lending Partner will further evaluate your case at that time and in most cases will advance additional funds. Yes, anything we receive from you or your attorney is used for a limited purpose of considering your case for a financial advance. We do not disclose information unless directed by you, your attorney, a lawful court order or a subpoena. Fill in the application below and we will contact you!